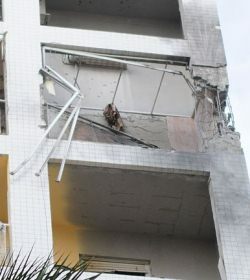 A building damaged by Hamas rocket fire (Photo: IDF). "Mommy, why is that house such a mess?" asked my four-year-old daughter. Her eyes grew wider as she scanned the computer screen with the images of chaos and devastation incurred by Thursday’s rocket attacks in Kiryat Malachi. On the way to school, I told my children, with no small measure of sadness, that we must ask G‑d to watch over our brothers and sisters in Israel. We said some Psalms in Hebrew, beseeching G‑d in the age-old words of King David, and added a few simple English words from the heart: "Hashem, please watch over our brothers and sisters living in Israel. Please keep them safe. Please make those who were hurt get better. Please send Moshiach so there won't be any sad people and this war will be over." Shaina said, "Mommy, it is a sad day for the people in Israel." And a few minutes later, "Mommy, I never want to go to Israel." I wanted to tell her, "Don't worry Shaina. Israel is the safest place for the Jewish people. G‑d is watching and protecting all our brethren there." But I couldn’t muster those words just now. In my mind's eye all I could see were forlorn orphan eyes crying bitter tears for parents murdered by Arab terrorists. What do you say? What do you think? How can we comprehend all this? A pregnant mother, a young man in the prime of life, a father of young children… all killed in our own land, the land that G‑d gave to us and promised to protect. Eventually I found some words to comfort my daughter. But what was I to tell myself? 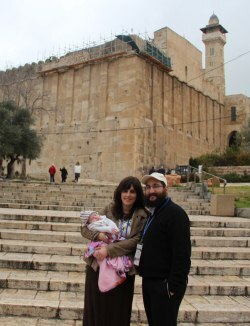 Last March I visited Israel with my husband and five-week-old baby girl. Throughout our trip, we met tremendous people. Heroes. People who have endured through tribulation and continuously take the shirts off their backs for our land. I was fortunate to celebrate my 28th birthday literally in the land of my fathers—in the holy city of Hebron. My great-grandfather, Moshe Goldshmid, of blessed memory, and his family were sent there in 1927 by the sixth Lubavitcher Rebbe, Rabbi Yosef Yitzchak Schneersohn, to serve as his emissaries. My great-grandfather was a ritual slaughterer and held a respected position in his community. Local Jews and Arabs would turn to him to arbitrate their disputes. Then, on Friday, August 23, 1929, fueled by false rumors that Jews were planning to seize the Al-Aqsa Mosque on the Temple Mount, Arab rioters attacked Jews in the Old City of Jerusalem. Word of the attacks and disinformation spread quickly, and soon full-fledged pogroms broke out in Hebron, Safed, and elsewhere across Israel. In total, 67 Jews were massacred that day in Hebron. I know there were children who had to be warned not to cry, so as not to give away their hiding places. But I didn't have to be warned — we were too afraid to cry out. I lived in a two-story house—we lived upstairs and an Arab family lived downstairs. That morning some of our Jewish neighbors came to be with us, in our house. I remember a gang of Arabs trying to break down our door. When they didn't succeed, they started using knives to cut out panels of the door to get in. My father tried to prevent them from breaking in, and the knives cut his hands. But that didn't deter him. While he was at the door the others in the house jumped downstairs from the back porch. The Arab neighbor didn't want to let them in, but there was a pregnant woman in the group, and his wife had mercy on her and let them in. She gave birth in that house, and they all survived. Mina and Avi Richler at a memorial for the Hebron Massacre victims, including her great-grandfather. When the mob finally broke into our house they grabbed my father. My mother tried to fight them off, but she was not strong enough and they stabbed her. She fell to the floor. They took my father into another room. My older sister, six years old, also tried to fight the men who were killing my father, and they axed her in the head. My mother yelled out to me and my younger sister, then a year and a half old, to hide, so we hid under a bed in another room. When there was quiet in the house, my mother tried to crawl to the room where they had taken my father. Just then a man came in and stabbed her again. They killed my father. I remember seeing him stretched out, dead. I also remember seeing my mother and sister wounded. They were hurt badly but lived. My younger sister and I were not injured. When I was older I would come to Hebron. I would participate every year in the memorial service at the cemetery for my father. After the 1967 War I even went back to visit the house where we had lived. I remember exactly where it is. Today it’s not accessible again because it’s in the area controlled by the Arabs. I would always walk the streets of Hebron, never afraid. We must never let anyone think that we are afraid. This is our city. It is good that Jews again live in Hebron. When we don’t have answers, we turn to our parents, to our ancestors. My daughter Shaina asked me a question. I answered her, but could not find peace within myself. So in my mind’s eye I turned to my ancestor, to my own grandfather, who answered my question. We cannot be afraid. We don’t know why such pain is inflicted. But we know there is Someone orchestrating Up There and, whatever His reasons, we have a job to do. When I was walking the streets of Hebron last year holding my five-week-old baby in our land so deeply threatened by our enemies, I was responding to the atrocities committed there with a simple statement: Am Yisroel chai! We are here and alive. You tried to kill us and take away our land, but we prevail. And we always will. But it is not in our own merit that G‑d helps us prevail. We have to thank those who have sacrificed for us—the generations of Jews who gave their lives, figuratively and literally, for our land. And we have to make sacrifices ourselves. There are no words, no reason, nothing really that can answer the burning of "Why?" when innocent people die. Perhaps, though, there is an answer to "How? ": How can we change this devastating reality? As I pulled up to my children's school and unloaded them from the car, I told them, "Today we are going to do some extra mitzvahs so that G‑d will watch over all our brothers and sisters in Israel.” Shaina and her siblings excitedly took their extra tzedakah coins and put them into their backpacks. In their purity, they knew they were helping the situation. As they really, truly are. 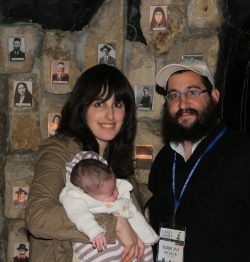 Mina and Avi Richler at the Cave of the Patriarchs in Hebron. When we do a mitzvah, just a small little good deed, we are sacrificing some part of our selves—giving some of my time to someone who needs it, giving away my earnings to charity, putting my pride away to apologize to someone I hurt. We are pushing away the darkness and hate, and increasing light and love. And we are drawing ever closer the day when we will greet our fathers and mothers, our brothers and our sisters, in our land full of peace and joy, the day when G‑d will erase pain and tears from the face of all mankind. Until then, I pray that G‑d watches over the Jewish people in the Land of Israel and lovingly protects them from our enemies. Mina Richler co-directs the Chabad Center of Gloucester County, New Jersey, with her husband.